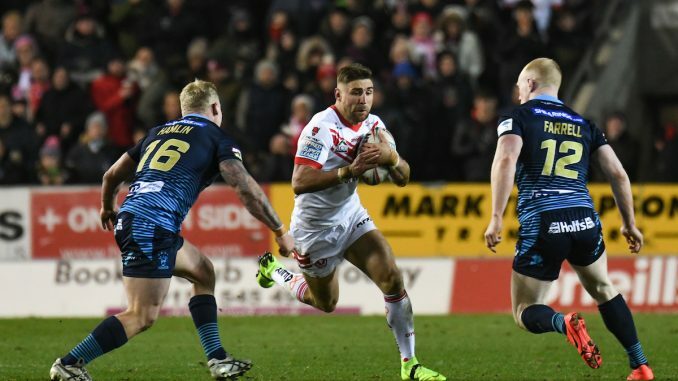 St Helens claimed the bragging rights as they beat local rivals Wigan 22-12 in the opening game of the season. 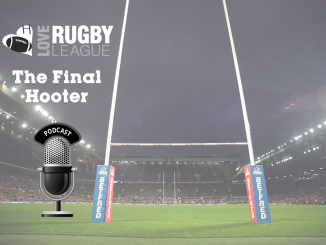 St Helens started the better side and new recruit Kevin Naiqama scored the first try of the 2019 Super League season as he skipped past Dan Sarginson to dive over. Jonny Lomax soon darted over after supporting a Dom Peyroux break and Saints led 12-0 after 15 minutes. Wigan came back into the game in the second quarter. Wales international Ben Flower powered over from close range, before an 80-metre Liam Marshall intercept try saw the score level at 12-12 at the break. Regan Grace produced a spectacular finish in the corner shortly after the restart which edged Saints back in front. And with just five minutes left, James Roby scooted from dummy half to barge over the line. 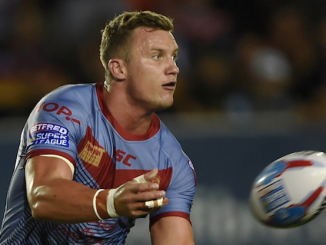 Mark Percival’s conversion saw Saints run-out 22-12 winners in the opening game of the 2019 Super League season. Lachlan Coote, Kevin Naiqama and Joseph Paulo made their competitive debuts for St Helens and they all caught the eye. Apart from an intercepted pass and a knock-on under a high ball, Coote was absolutely outstanding. 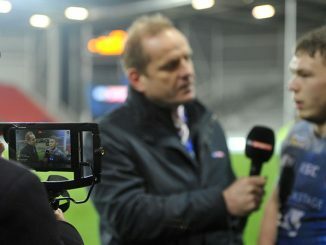 His reading of the game was second to none and he was always in the thick of the action when Saints were going forward. Naiqama was sensational in the first half and certainly got Saints fans on their feet with a couple of swift moves in attack. He showed fine footwork in the build-up to his try. And while Paulo didn’t standout as much as Coote and Naiqama, the Samoa international certainly played his part and added size to Justin Holbrook’s pack. Many eyebrows were raised before the match about Holbrook’s decision to drop Danny Richardson from the side and give Theo Fages a start. The France international played the full game and went back to basics. His style of play was simple but effective. He led Saints around the park brilliantly. Fages brought a fine kicking game alongside Coote and he could be Saints’ secret weapon among the big names in their side this season. Holbrook will no doubt have a selection regarding the half-back positions this season, but it is a headache he will welcome. Joe Bullock and Zak Hardaker made their official bows for the Warriors and they both had solid games, with the former being Wigan’s best forward. The former Barrow Raiders front-rower made a huge impact whenever he came off the bench and really added grit to Adrian Lam’s forward pack. Wigan certainly like their project players, with the likes of Romain Navarrete, Willie Isa and Gabe Hamlin shining in the first-team in recent years. Bullock is a big boy, who has a quick burst of pace. He earned a lot of praise from Lam after the game. 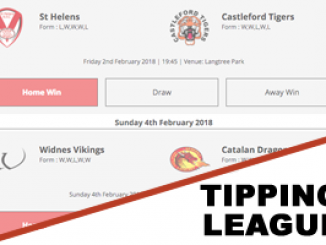 St Helens: Coote (8); Makinson (6), Naiqama (8), Percival (7), Grace (5); Lomax (6), Fages (9); Walmsley (8), Roby (8), Thompson (7), Taia (6), Peyroux (7), Knowles (7). Subs: Paulo (7), McCarthy-Scarsbrook (7), Amor (6), Lees (6). Wigan: Hardaker (7); Davies (6), Sarginson (5), Gildart (6), Marshall (8); Williams (6), Leuluai (5); Flower (8), Powell (7), Navarrete (6), Greenwood (8), Farrell (6), O’Loughlin (7). Subs: Isa (5), Hamlin (6), Clubb (5), Bullock (8). 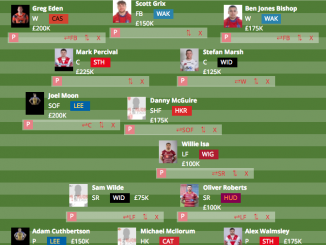 St Helens are going to be a very, very difficult team to beat this year (if it wasn’t already obvious!). What is very pleasing for Saints this year is that they have got plenty of strength in depth. You know you’ve got a class team when you’ve got someone of Danny Richardson’s calibre not making the squad. As for Wigan, they missed Jarrod Sammut’s creativity in the halves. They didn’t offer much when they were near the line and their kicking game was poor on the night. They just didn’t have that spark in attack. But they can take positives out of the game. Back-rowers Joe Greenwood and Liam Farrell were impressive in the back-row while Joe Bullock looks one to watch.